Every Monday afternoon for the past several weeks, I have driven to New Orleans for a weekly art class. Although the class is wonderful and I am lucky to be able to stay overnight with my beloved friends Dana and Justin and their dog Fred, the drive back and forth is long and torturously boring and involves crossing several dangerous bridges. In order to pass the time/ stay awake, I’ve been listening to audio books. I’ve found that I’ve had the most success with audio books that are heavily plot driven, not too philosophical, and set sometime in an era well before World War I. If they are performed by an engaging dramatist with a strong upper class English accent, so much the better. Mr. Midshipman Hornblower, as read by Christopher Radeska, not only satisfies these criteria, but exceeds them to the one thousandth power. HH is without a doubt the best driving companion one could ask for. Although anyone familiar with the Hornblower saga would certainly agree with this assessment (unless they are a dirty son of a swab lubber), people unaquainted with the indisputable awesomeness of HH are often skeptical. Naval genre fiction? 11 books? A hero named Hornblower? Not so compelling to your average person. But those people are wrong. I will admit that it is pretty surprising that Mr. Midshipman Hornblower is so extraordinarily good, and not only for the above mentioned reasons. For one, it has no real plot to speak of. The narrative more or less consists of nothing but a chain of episodes in Horatio Hornblower’s early life, following the progress of his career as a midshipman from his first bout of seasickness, through several personal conflicts, battles, and tests of manliness, to (SPOILER ALERT) his promotion to the rank of Lieutenant (it’s pronounced “lef-tenant,” actually). There is no rise or fall or stunning climax — just a bunch of stuff that happens and proves Hornblower’s innate strength of character and quickness of mind. 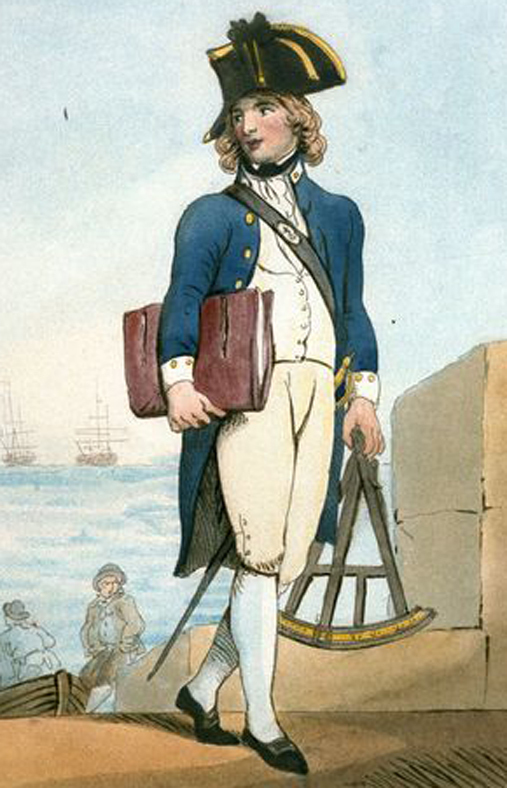 The book is also cluttered with 18th century maritime vocabulary, which can make it difficult to understand if you are neither a maritime historian with a particular knowledge of the 18th century British naval fleet, nor Lord Nelson himself. I know what a mainsheet is and what it means to reef a sail, but I’m a little shaky when it comes to differentiating between a frigate, a schooner and a sloop. C.S. Forester is so precise and thorough in his descriptions and so obviously enamoured of every last bit of historical detail relating to the Anglo-French Wars that he just can’t help himself when it comes to explaining exactly how to load a swivel gun, even if a less erudite reader (like myself) would really rather find out how HH is going to distinguish himself in battle next. Lastly — and most shocking of all — Mr. Midshipman Horatio Hornblower contains no romantic subplot. HH wastes away from seasickness, fatigue, and captivity on the Spanish coast, but unrequited love is definitely not on the charts. There’s not even a single flirtation. Not one loose woman or virtuous Captain’s daughter. Just a whole lot of feats of manly courage and adventure on the high seas. And yet, in the face of all obstacles and impediments, Mr. Midshipman Hornblower rises triumphant, proving himself to be completely, entirely, inexplicably captivating. Why? Perhaps it’s the reader’s concern for the character of Mr. Hornblower himself, who, after all, is just a young guy and forced to carry so much upon his shoulders. C.S. Forester is also a wonderful writer in that stolid, reserved, refined British tradition that is so appealing to people who still think the UK is all country manors and oak panelled libraries (I can tell you that unfortunately this is not the case). And, even if there is no plot in the classical sense, all of Hornblower’s adventures are so thrilling and his enemies so despicable that one hardly notices. It is impossible to read Hornblower without noticing how difficult it is for C.S. Forester to hide his complete and total aversion to any nationality that does not start with “E” and end with “-nglish.” (Yes, Hornblower was officially fighting for Britain at that time, but old C.S. pretty much considers them to be one and the same. Apologies to Scotland, Wales, and the bloody Irish.) In the world of Horatio Hornblower, the French are pompous and cowardly, the Spanish “Dons” are disorderly and cruel, and the inhabitants of the Barbary coast are treacherous, brutal, and infested with the Plague. In the audio books, these national characteristics are further emphasized by the reader, Christopher Radeska, whose highly spirited imitations of foreign accents are definitely humorous in a 1940s cartoon way, but maybe not so flattering to speakers of the languages in question. The English, on the other hand, are efficient, honorable, and humane. They are repulsed by slavery, disciplined in warfare, and always prepared to do the right thing, even at great risk to their person and liberty. While this contrasts wildly with the picture of the English painted by their colonial subjects, Horatio Hornblower is so full of pluck and derring-do that you’re willing to forget that there was ever a dishonorable bone in a native English body. Although Mr. Midshipman Hornblower is an extremely engaging novel, those long technical passages about trimming sails, etc…, do make room for wandering thoughts, and I sometimes find myself wondering just what Horatio Hornblower, epitome of all that is English, would think of Brexit. There is no question that he would be dismayed by the idea of unification with those suspicious “Continentals,” but it is clear that once the act had been condoned by HRM the King of England, he would be ready and willing to accept the judgement of his betters — and prepared to carry out their orders at any cost. In Hornblower’s world, it would be unthinkable that the British might be the ones to break an agreement; Englishmen hold true to their word as a matter of honor (or, “honour”) and would surely never cross their allies, even if it meant enduring shocking ignorance, inefficiency, and Papism. In this case, I can only conclude that HH would be reserved in his personal approval of the customs and behavior of these Europeans, but he would never consider failing in his duty to his allies should they fall prey to either the forces of injustice or excessive bureaucratic regulation. Indeed, he would draw upon his inexhaustible store of courage and innate love of all that is good and right to faithfully serve out his orders in the name of King and Country. So, no, Mr. Midshipman Hornblower would have never voted for Brexit — in fact, he would have been totally blown away by the idea of voting at all. Like those godless French Republicans, what? Belay that! Horatio Hornblower had no time to occupy himself with this sort of pointless musing — he would have been too busy outwitting the Spaniards and swinging from the sheets and steering fiery ships out of the path of the British armada. And so should we, too, follow his example. Too much politics makes for too few adventures — the Single Market and free movement of persons be damned! Buy the book here in the UK! And here in the USA! Next Pas de Deux Update #3: Terrible explosions! Deadly gasses spewing from the engine bay! Benn’s life in peril! Pas de duex looks like the makings of wonderful adventures, bring her west to the next island over when ye need to stretch yer sealegs ( note the use of the nautical ‘yer’). It’d be great to catch up for a longer visit when ye do. Re books on sailing, check out Denys Rayners books, particularly ‘ safety in small craft’, it’s full of lifesaving tips (eg don’t forget your nail file when going to sea) and pocket sized so well within regulations to bring aboard. Happy floating, and future sailing, when you get to the saner (somewhat) side of the pond. Hi Barry and Mary! Thanks for reading! We would love nothing more than to make a tour of Ireland by boat- Benn says it’s dangerous, but I say pah! And thanks for the book recommendation – we need all the lifesaving we can get!